The two-story Neoclassical Revival-style residence at 479 Audubon Street was constructed c.1902 for Emile Dreuil, a prominent cotton exporter and native of St. Lucia in the British West Indies. Following the Dreuils, the home was owned by the family of Dr. William and Mary Scott Phillips from 1914 to 1951. During this time, the Phillips worked with architect Richard Koch to remove a former service wing, reconfigure the rear of the house, and expand the dining room. Samuel Zemurray, president of United Fruit Company, acquired the property in 1951, but held onto it only briefly. In 1953, it was sold to George Montgomery and his wife, Anne Kock Montgomery, who resided at 479 Audubon Street for over four decades. When the current owners purchased the home in 2016 and decided to renovate, they selected architect Megan Bell of Bell Butler Design and Architecture to oversee the project. The homeowners wanted to update the living spaces and introduce a contemporary aesthetic, while respecting the home’s historic character and existing footprint. The most extensive alterations were at the back of the house, where a fireplace was relocated to an exterior wall and rooms combined to create an open plan kitchen-dining-living area. New steel French doors from Hope’s Windows frame views to the rear patio and pool. The fanlight transoms lend a “conservatory feel” to the space and set up a connection between indoor and outdoor living spaces, an important aspect of the design. Photos taken by Ross Peterson of Fifth and Prime. One of the most substantial challenges involved removing the wall between the existing kitchen and den. “The wall was load bearing and happened to contain several essential plumbing, gas and electrical lines that had to be rerouted. We worked closely with a structural engineer to resolve this while keeping the ceilings continuous and as high as possible. The result was an open kitchen and living space that was a wonderful canvas for the owner's design ideas,” said Bell. Another significant challenge for the homeowner and architect was deciding what to touch and what not to touch. 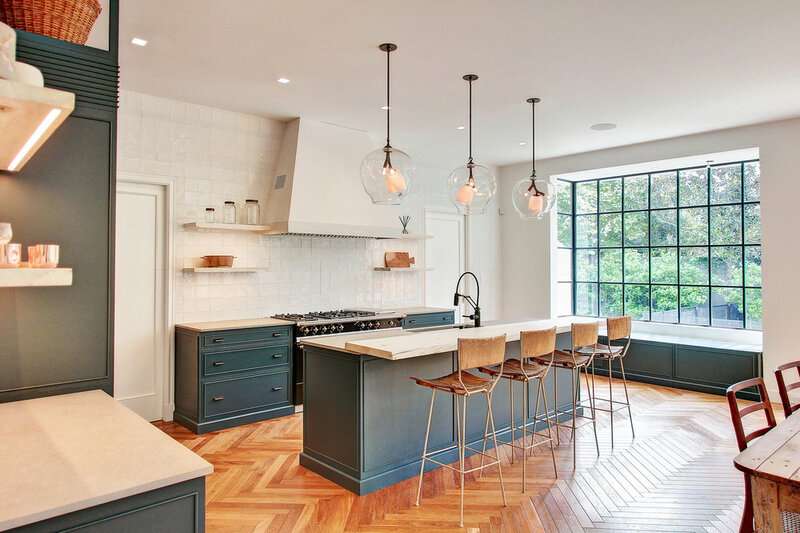 For example, new French oak herringbone floors were installed throughout the first floor, while existing wood floors on the second floor were refinished. Paneled wood doors and built-in millwork were retained, but baseboards, door casings, and window surrounds were replaced with new custom-milled trim. Such decisions are “always a challenge on renovations,” said Bell, “because you realize throughout the process that 'the time is now' to make the changes that make the space feel intentional and new.” In the case of 479 Audubon, the interplay between contemporary design and historic character has resulted in beautifully transformed, light-filled, and welcoming home. PURCHASE TICKETS TO THE HOME TOUR TODAY! This article was written by Beth A. Jacob, AIA, Senior Associate of the MacRostie Historic Advisors New Orleans office.